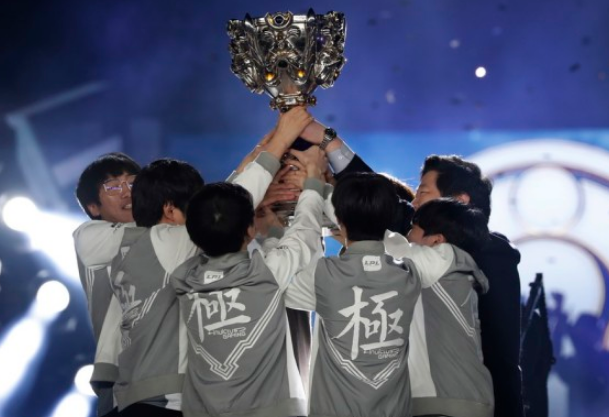 Chinese eSports club Invictus Gaming (iG) claimedChinese mainland's first world championship inLeague of Legends (LOL) after beating Europeanteam Fnatic 3-0 in Inchon, South Korea lastSaturday. Few predicted IG to win, as the club was the lastteam remaining from the Chinese mainland. The most hopeful team, Royal Never Give Up (RNG), lost in the quarterfinal to anotherEuropean team G2. The powerful South Korean teams, ruling the championship for five years, also failed to makeout of the quaterfinals. But Invictus carried on with an excellent performance, beating both G2 and Fnatic 3-0 to takethe crown. This is also IG's revenge after the loss to Fnatic three years ago in Paris, France. The Chinese mainland teams, including Invictus, have been pursuing the championship foreight years. "I have been wishing for this moment for so long time..." the star player of IG, Song "Rookie" Eui-jin, said in the after-match interview in both Korean and Chinese languages. Rookie started playing professional LOL in 2013 in his home country South Korea but laterjoined the Chinese league in 2014. He tried so hard to get along with the team that he even learned Chinese which he now speaksfluently. "It's IG that won the championship for the Chinese league. I hope people can pay moreattention to our team," Rookie said in the after-match interview.